Helmets protect the skull from fractures but can’t cushion the brain. And there is evidence that when athletes think that they are better protected, they hit harder. 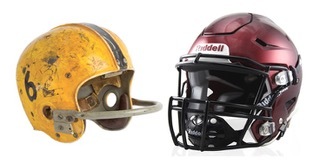 Larger, heavier helmets may in fact increase the risk of injury to younger players because their necks are not as strong as adults’ and cannot fight against sudden twisting or the head bouncing against the ground. When the head suddenly stops, the brain keeps moving until it hits the inside of the skull. And when the head is jerked to the side, neurons stretch and tare. The forces that directly injure brain tissues also trigger cascades of metabolic and inflammatory processes that can cause further damage continuing for months to years. Young athletes’ brains are especially vulnerable to injury during their critical periods of development. Concussion symptoms including headaches, nausea, confusion, dizziness, cognitive problems, irritability, fatigue, depression, light sensitivity, and sleep disturbances can emerge immediately following a concussion, or years later. Recent research has confirmed that the damage from multiple concussions can go undiagnosed and only cause debilitating neurological consequences beginning 8 to 10 years after repetitive concussions. Hyperbaric Oxygen Therapy (HBOT), in which a person breaths 100% oxygen under increased atmospheric pressures, has been shown by research and clinical experience to be safe and result in positive responses in concussion and traumatic brain injury. HBOT is known to reactivate and stimulate growth of nerve cells and blood vessels, increase stem cell production, reduce inflammation and swelling, and drive thousands of genetic pathways necessary for healing. HBOT should be considered as part of a comprehensive program of medical care for any concussion. Concussion Protocols do not heal the brain. These protocols are vitally important in reducing risk of additional concussions once one is suspected. But, they do nothing to heal the brain or prevent ongoing cellular damage. Treating symptoms and waiting for improvement in cognitive testing does not mean the brain has healed at the cellular or metabolic level. It is critical that an injured brain have time to fully heal. HBOT can be a major factor in that healing. All suspected head injuries should be evaluated by a qualified medical professional.